I intentionally avoided putting too many limits on myself at the start of this project, because I wanted to leave myself a little bit of room to help wherever I thought it would be needed. I'd considered making one of the rules say that I had to do an hour of service for somebody different each day, to keep things from getting boring for my readers, but decided that I wanted to be careful about even limiting myself that much. I mention all of this because I know that today is my third visit to Second Helpings so far (and I'm planning one more next Tuesday). I have to tell you, though - I love it. I'm probably going to try and keep going at least once a week even after Project Advent is finished. It's fun, it's close to my work, and it's rewarding. One of the friends I've made there is another regular volunteer named Nell. She really made me feel good today, telling me that she was so glad I'd kept coming, and that it meant a lot to her to see me there. I kind of want to see if Nell will adopt me as her grandson. Today's menu was spaghetti with meat sauce, three different kinds of vegetables, chicken, bread, salad, fruit cocktail, and cake for dessert. Most of the food prep was pretty well underway when I arrived and signed in, but there was one more task that nobody else seemed to want: chopping onions. For whatever reason, onions have never bothered my eyes all that much, so I washed my hands, put on an apron, and got to work. As I chopped, I wondered what I would mention about today's project when I wrote it up, to make it interesting. Then I heard lots of voices coming from the next room, and went in to see that the Texas Tech men's basketball team had just arrived! 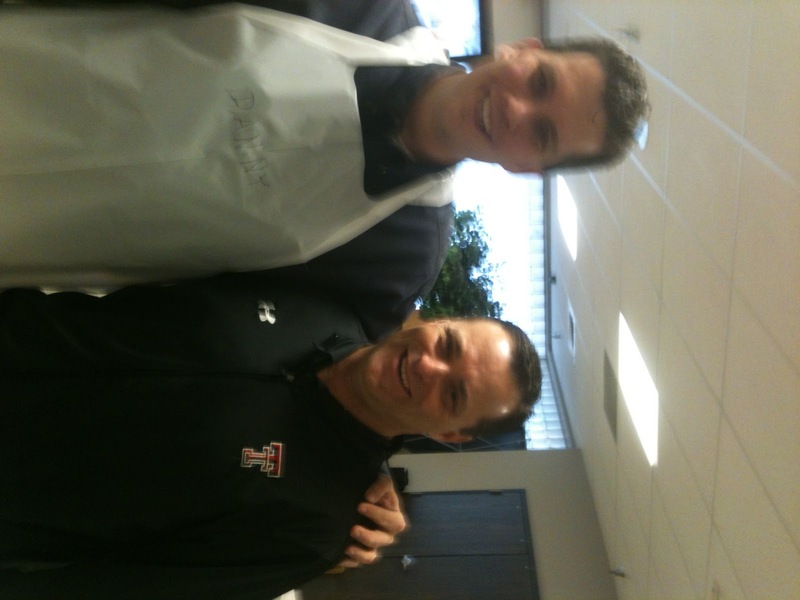 New head coach (and former Texas A&M coach) Billy Gillispie is having his team participate in twelve days of service projects, the Red Raider 12 Days of Christmas, and today they were helping us at Second Helpings. Their coaches put them to work rolling up plasticware inside of napkins, and I stepped across the room to introduce myself to Coach Gillispie. Now, if you follow college sports much (which I admittedly don't), you may remember a few years ago when Coach Gillispie left A&M. There were some very hard feelings about how he made the announcement and the move. I have to admit that I was pretty sore over it, too. I'd never been much of an Aggie basketball fan until he got there and turned the program around, and when he left so abruptly, it was upsetting. It was the kind of thing that a guy (like me) and his buddies might sit around and grumble about over beers, while saying things like, "If I ever get eye-to-eye with that guy..."
Fortunately, I lack the courage of my drunken convictions, because it turns out that Coach Gillispie is as friendly a guy as you could hope to meet. I introduced myself, told him that I'd loved watching him turn A&M's team into a winning one, and that I looked forward to watching him at Tech, too. Then I asked him if I could get a picture with him - this is when I figured out the problem with my phone's camera. The problem is that I keep handing it to old people who have never used a camera phone before. At least BCG is in focus in the picture. 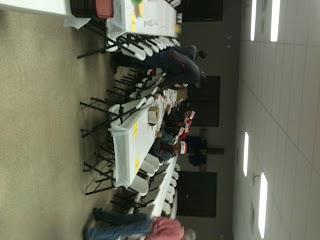 After the team and volunteers had all eaten, we began getting ready to serve. The meal always begins with announcements and recognition of anybody whose birthday is that day. After that was taken care of, the team was introduced, and Coach Gillispie briefly addressed the room to thank them for the opportunity to come serve. One of his players, Robert Lewandowski, gave a blessing, and then we began to make plates. Usually, the people in attendance walk through the line and receive their food, but we did it differently today. Our guests remained seated while the servers put food on the plates, and the team waited tables, taking plates out to the guests. In almost every situation that I'm in, I'm the tallest guy in the room. That's why I had to get one more picture today, flanked by people taller than me. These two players put their guns up, and I had the last-second idea to try and flash a Gig 'Em, but I didn't get my thumb out fast enough. You can kind of see where my hand is coming up behind the edge of the guy's apron to my left. A generous friend gave me five tickets to take my family to see the Red Raiders play Cal State - Bakersfield on December 27th, since I'll be on vacation from work. 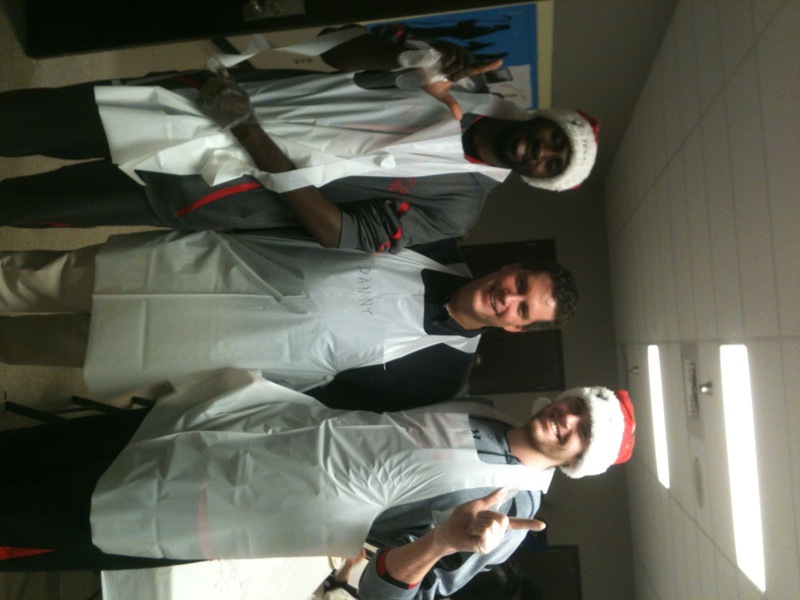 I'm really looking forward to it, especially now that I've worked alongside these guys. They're a wonderful group, and I think it speaks volumes about them that they're out in the community giving their time right in the middle of final exams. I'll be cheering them on this season, except on January 14th, when they'll be making a long, tearful trip home from College Station. Gratitude Project: I'm afraid I have to be a little cryptic on this one for the time-being, but Courtney and I had a very positive report yesterday about something that we've been in prayer about. the three of you look like totally average human beings when pictured together! also? i'm now beginning to think it's YOU that can't be in focus in pictures since coach is completely un-blurry... are you a GHOST?! I met Seth Wand (former Texans player) through a co-woker of Doug's in Wand's first year in Houston. Doug later commented to me: "Isn't that guy HUGE?" My response? "Not really, I mean he's tall, but. . . ." Doug was astounded at my response. Then I said to him: "Hon, remember, I was friends with Danny and Casey all through jr high and high school. You have to be taller than 6'2 for me to be impressed!" My kids view me as the offspring of Superman and Albert Einstein, and George Washington is my uncle. Because I am awesome. I should've thrown a sweet little old lady into the picture to provide some contrast, huh? And you just gave me another great screenplay idea. I'm a CHRISTMAS ghost, and my 24 days of service are what I have to do in order to release my spirit. Kind of like "Ghost" meets "A Christmas Carol." With a dash of "Tommy Boy" thrown in, just to keep it fun. That is a fantastic story. I love that I'm still your measuring stick for height. You also made me think of that Shania Twain song "That Don't Impress Me Much." True story - one time in 1997 I was in the same room as Michael Jordan. I mean, it was a big room, and it's not like we were having drinks together or anything, but there he was, across the crowd. I looked over, met his eyes for a second, and then felt awesome, because I am exactly as tall as he is. my. that movie sounds. intricate. also? for future interactions with old ladies: try not to "throw" them around so much. it'll seriously hurt your karma if you bruise an old lady.